Closed Circuit Television (CCTV) cameras are extra eyes to see hidden areas instantly. They can be viewed on your touch screens around your home e.g. in the kitchen and in your bedroom. We can also integrate the cameras to be seen on a whole house Audio/Video System. 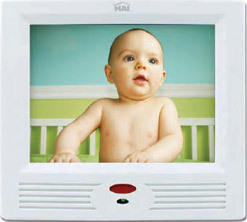 Try the HAI Omni Touch Demo "Click" Video. For full screen view just "Click" on the picture. Easy, convenient and friendly. We are also able to offer commercial CCTV options for your business. Conventional camera systems as well as IP network camera solutions. We also do commercial remote monitoring i.e. Watch your business from favourite lounge chair at home.